Glendale, Arizona is a satellite city of Phoenix boasting a fairly large population and an incredible emphasis on sporting events. A variety of teams call Glendale their home, including the Phoenix Coyotes and the Arizona Cardinals; it also is host to Super Bowl XLII and new home to the Tostitos Fiesta Bowl. A sports oriented city, any enthusiast would love a Glendale property close to all the action. 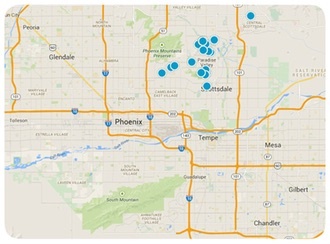 Searching for homes for sale in Glendale, Arizona is simple with the Russell Shaw Group. With many options for how to begin, we give you every resource available and help you with any questions you may have. As your Glendale, Arizona real estate agents, we have access to more listings and better deals than other REALTORS®, making it clear why you should choose Russell Shaw to help you buy your Glendale home. It is our business to know of any homes for sale, and part of that business is sharing our information with you. Browse our listings or call an agent today to find out what great properties are currently available!